The monitoring of the underwater cultural heritage is a priority of Public authorities (e.g. Ministry of Cultural Heritage, Institutions and local entities) that deal with conservation and restoration activities. These public bodies need cost effective, reliable and systematic survey techniques and means to accomplish their mission and everyday work. The development of specific techniques, methods and tools based on the processing of Earth Observation satellite data makes possible the production of systematic survey of wide coastal areas, without any destructive impacts. In such way, ITACA is promoting a real integration between the use of compatible, non-invasive technologies, protection and conservation of resources and local cultural identities by providing high value tools in a cooperation framework. Analytically, high resolution synthetic aperture radar (TerraSAR-X, Cosmo-SkyMed) and multispectral satellite data (WorldView-2) will be combined to derive the relative bathymetry of the bottom of the sea up to the depth of 70 meters. The resulting data fusion will be processed using shape detection algorithms specific for archaeological items. The new algorithms, the physical modelling and the computational capabilities will be integrated into a Web-GIS, together with data recorded from surface (2D and 3D modelling) and from underwater surveys Additional specific archaeological layers will be included into the WebGIS to facilitate the object identification through shape detection techniques and mapping. Improving the capabilities to locate and monitoring underwater archaeological sites in coastal zone towards the implementation and deployment of an innovative system integrating remote sensing and image processing techniques. Develop and deploy a management and operation tools for underwater archaeological sites. ITACA project includes the development of a WebGIS management and operation tool to integrate remote sensing data with a 3D representation of the underwater “reconstructed site” to provide guide the underwater operations ad complementing traditional mapping. 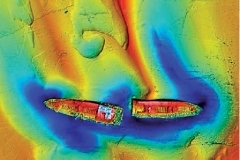 Monitoring of ship wrecks, ruins and historical artefacts that are now submerged. Analyses the impact of the new achievable observation products and tools on the marine market and related follow-up applications. ITACA project is coordinated by Planetek Hellas E.P.E. (GR) and includes the following institutes and companies: Kell Srl (IT), NAIS Srl (IT), DHI GRAS (DK), I.EN.A.E (GR), FFCUL (PT), ANESTI Ltd (UK), Regione Sicilia (IT), ALMA sas (IT), CODEVINTEC Srl (IT), SME4SPACE (BE).